Not to be confused with Nerve to the obturator internus. The obturator nerve in human anatomy arises from the ventral divisions of the second, third, and fourth lumbar nerves in the lumbar plexus; the branch from the third is the largest, while that from the second is often very small. 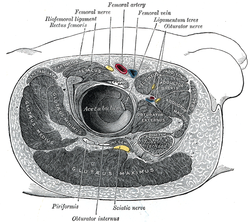 It descends through the fibers of the psoas major, and emerges from its medial border near the brim of the pelvis; it then passes behind the common iliac arteries, and on the lateral side of the internal iliac artery and vein, and runs along the lateral wall of the lesser pelvis, above and in front of the obturator vessels, to the upper part of the obturator foramen. Here it enters the thigh, through the obturator canal, and divides into an anterior and a posterior branch, which are separated at first by some of the fibers of the obturator externus, and lower down by the adductor brevis. The obturator nerve is responsible for the sensory innervation of the skin of the medial aspect of the thigh. The nerve is also responsible for the motor innervation of the adductor muscles of the lower limb (external obturator. adductor longus, adductor brevis, adductor magnus, gracilis) and the pectineus (inconstant). It is, notably, not responsible for the innervation of the obturator internus, despite the similarity in name. Variations in origin and course of obturator artery.